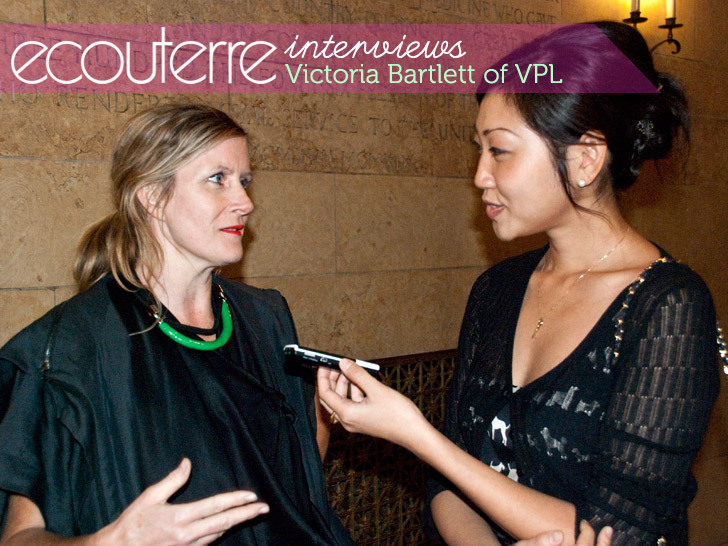 At Ecouterre, we’ve always been fascinated with designer Victoria Bartlett‘s ability to create fantastic fashions without having to use the furs and skins of animals. So we were delighted to have the chance to speak to this cruelty-free fashion pioneer recently at the annual “Healthy Food in Fashion” fall gala. We chatted with Bartlett about how she thinks we can get more designers to practice cruelty-free fashion, the significance of her controversial human hair accessories, and her favorite meat-free recipe. At Ecouterre, we've always been fascinated with designer Victoria Bartlett's ability to create fantastic fashions without having to use the furs and skins of animals. So we were delighted to have the chance to speak to this cruelty-free fashion pioneer recently at the annual "Healthy Food in Fashion" fall gala. We chatted with Bartlett about how she thinks we can get more designers to practice cruelty-free fashion, the significance of her controversial human hair accessories, and her favorite meat-free recipe.